Genetically modified animals are animals whose genetic makeup has been altered by scientists, a practice that is also known as genetic engineering. 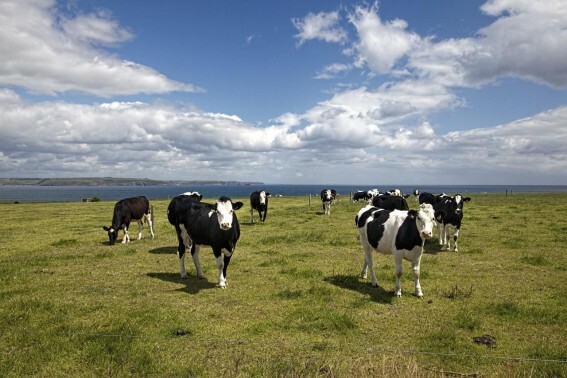 Most people are familiar with GMO foods, but animals have been a large part of GMO research. The first genetically modified animal was a mouse, created in 1974 by Rudolph Jaenisch, and since then research has expanded to include fish, insects, and farm animals. Check out the slideshow below for more information on genetically modified animals. The first genetically modified animal was a mouse. Genetically modified mice are used often in research. 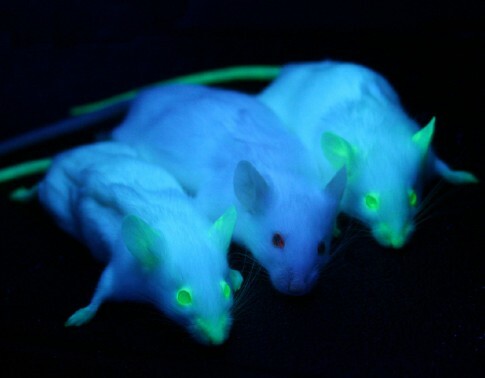 The mice pictured have a special protein that makes them glow under blue light. 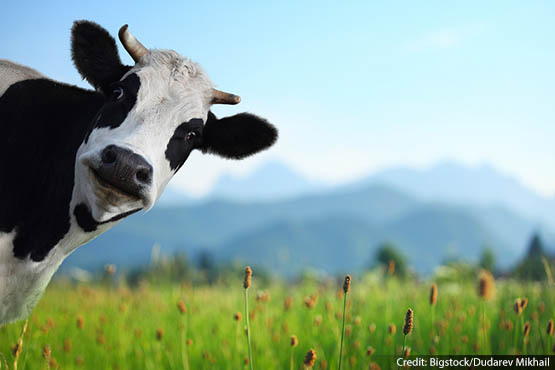 In 2011, Chinese scientists created cows that were genetically engineered to include human genes. They hoped that the cows would produce milk similar to the kind that humans produce, for mothers who can't make their own. 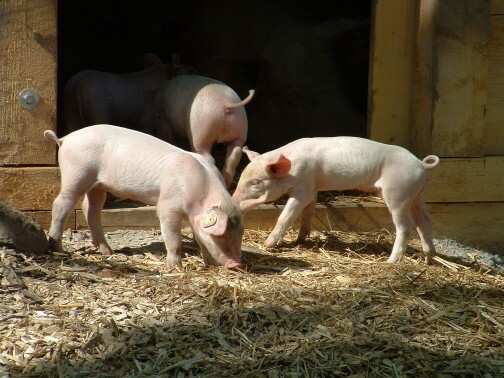 In Canada, scientists created a genetically enhanced line of pigs called "Enviropigs." They believed that these new pigs could reduce the cost of feeding them by reducing the amount of food the pigs need to survive. 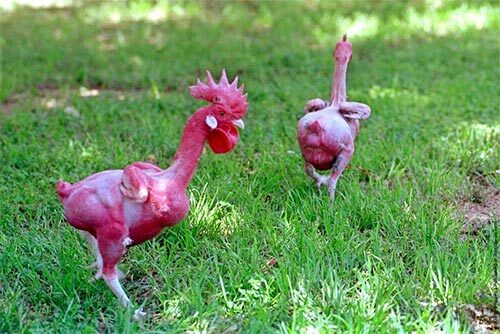 An Israeli geneticist created the first featherless chickens, also called "naked" chickens. The lack of feathers could make it easier to raise the chickens in warmer climates. The chickens are also lower in calories and faster-growing than normal chickens. In an effort to save the the thousands of people who die from Malaria every year, scientists created malaria-free mosquitoes. 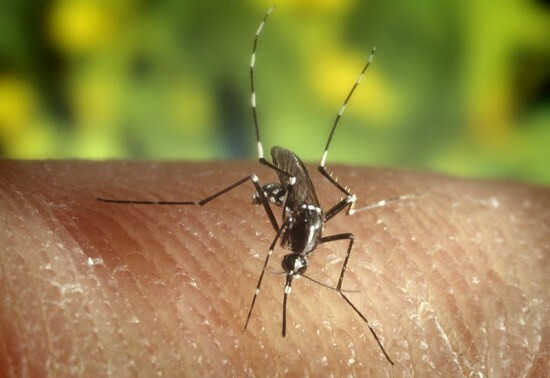 They believe that these new mosquitoes could mate with regular mosquitoes, and create malaria-free children, thus reducing the infection rate around the world. My class thought it was a beetle! The GMO animals is a good way to kill the wrong things happening to baby and toddlers.